"Thy Womb's" slow pace and unique approach to present Tawi-Tawi's culture will not be for everyone - that is a fact. The film will ultimately leave you wanting and itching for more. If that uncertainty is a good thing would greatly depend on your approach to "Thy Womb". But what we do know is that the stunted ending only magnifies further our sentiment while watching "Thy Womb". The sentiment that the film feels lost at critical moments and that the superb acting by the leads can only do so much. Shaleha (Nora Aunor) is a Badjao midwife in Tawi-Tawi. Ironically, Shaleha is an infertile woman and she and her husband Bangas-An (Bembol Roco) have decided that he will find a second wife to bear him a child. As Shaleha helps Bangas-An find the perfect wife, a true testament to her love of Bangas-An, she doesn't realize that she might be leading herself into one ultimate sacrifice. 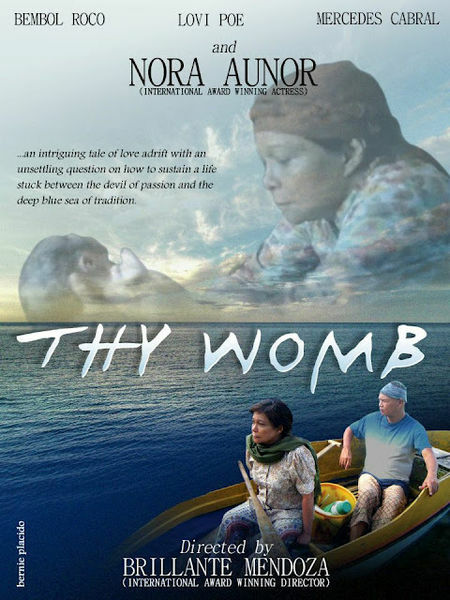 "Thy Womb" takes it time to weave a tale of life and love in Tawi-Tawi. The concept is brilliant but the execution left us wanting. The lead characters of husband and wife Bangas-An and Shaleha were interesting and perfectly-acted by Bembol Roco and Nora Aunor. The legends just shine on-screen especially the internally struggling character of Nora. But we did feel that they were stifled at times. This is in no way thanks to how the plot develops. The best way we could describe it is its peculiar. The slow pace and the concentration on the everyday lives of its leads is understandable - even magnificent. But we felt that it missed out or added elements that didn't feel crucial or if indeed important, was not given much time to show its significance. The jarring cuts and the sudden ending makes "Thy Womb" seem like a film lost in its own pursuance of Tawi-Tawi culture and it is a film full of ingenious ideas that just couldn't live up to their potential.